This painting is available as a limited edition signed and numbered print on watercolor paper. You can view and order the print by clicking here. My painting, Kissing Giantesses is featured on the cover of the Sept/Oct issue of Lesbian Connection Magazine. If interested in purchasing a limited edition print of the painting, you can view and order here. Contact me if you have any questions about the work. 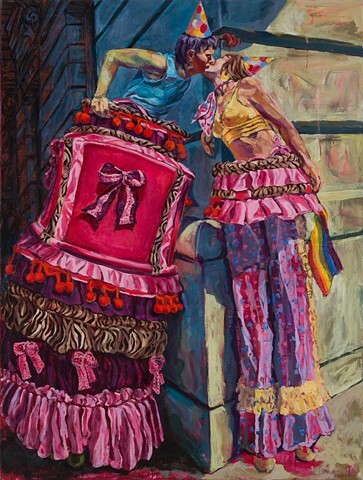 This kissing moment took place during the Baltimore City Pride Parade and the amazing costumes in the painting were made by Regina Armenta and can be seen on her website.